The 428 is Minnesota’s first building registered to pursue both LEED Silver certification and WELL Building Core & Shell certification. The 428 sets a new precedent in modern commercial work spaces. Walk in the front door and you’ll find something truly special. Capturing a mid-century architectural vibe, the building is thoughtfully planned to support personal wellness, environmental sustainability, and flexible company formats – from freelancers to mid-size organizations. It’s a progressive professional space that leaps into the future while honoring its past as the long-time location of F. W. Woolworth Co. department store. Indoor air will flow through MERV 16 filters, a step below hospital grade. Air standards make up for 29% of the features that make up the WELL Building Standard. The 428 will be built using no VOC construction materials, reducing the amount of indoor air pollution. All water at drinking fountains, kitchenettes and showers will be filtered of additives such as chlorine and fluoride. Daylight through every tenant space coupled with auto-adjusted indoor lighting provides an environment supportive of a person’s natural circadian rhythm. Having an open and prominent stair case has been shown to lessen the temptation to take elevators and provides an opportunity for tenants to stay active throughout the day. Incorporation of live plants and natural elements into the work environment has been shown to reduce tension and anxiety by 37% and reduce depression by 58%. Hot and chilled water heating and cooling reduces the use of refrigerants and 65% of the fuel for heating is produced by locally sourced wood waste. Composting organic waste is an effective way to reduce the 135 million tons of methane gas that is released into the air each year from food waste sent to landfills. Low-E glass windows reflect the heat back into the atmosphere, reducing the need for excessive heating and cooling. When it opened at 428 Minnesota Street in 1955, the three-story F.W. Woolworth department store was hailed as a modern marvel. Shoppers enjoyed state-of-the-art amenities like air conditioning and escalators, and merchandise that included professional attire at everyday prices. For thirty-seven years, Woolworth’s was a fixture on the corner of Minnesota Street and 7th Place East, and a convenient stop for downtowners to grab a burger at the lunch counter or pick up a snappy new tie. 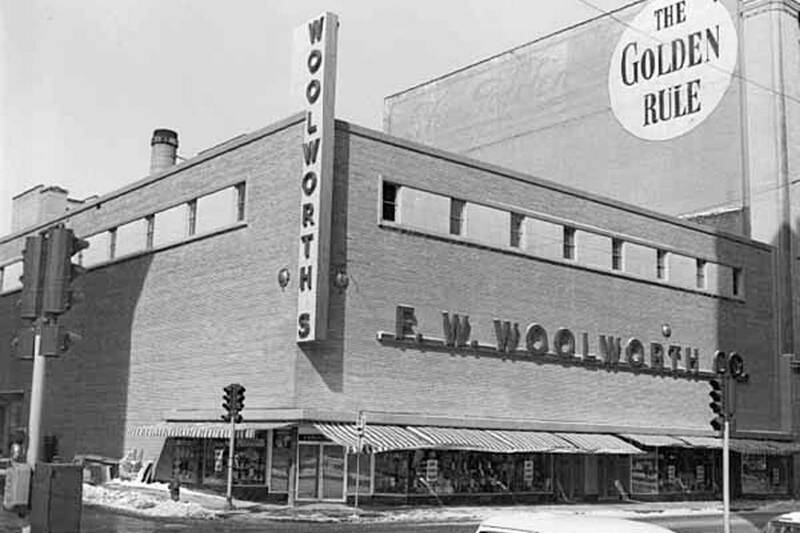 Times changed and Woolworth’s mid-century modern building eventually closed its doors in 1993. For the past 25 years the building sat mostly vacant and deteriorating. In 2015 the long-term land lease expired giving the building owner the opportunity to forge a new direction. Fast forward to The 428, which has reused the original building’s beams to anchor a future-forward approach to the modern work space. 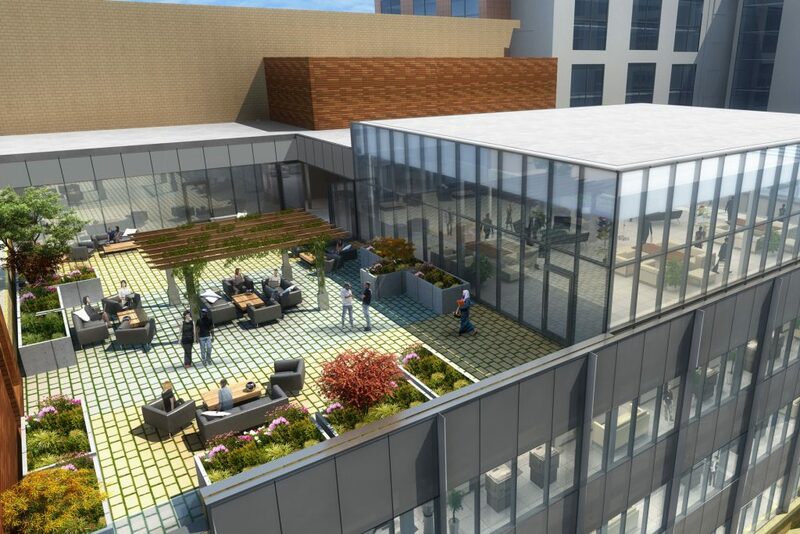 The 428 is Minnesota’s first building registered to pursue LEED Silver Certification and WELL Core and Shell Certification, and the first in St. Paul to pursue WELL Core & Shell Certification. The WELL Building Standard® is the first to integrate human health and well-being into the design, construction, maintenance and operations of buildings. WELL focuses on seven categories of building performance: air, water, nourishment, light, fitness, comfort and mind. It’s a performance based system that helps create a built environment that improves the nutrition, fitness, mood and sleep patterns of its occupants with an ROI for companies and organizations. The U.S. Green Building Council’s LEED green building program is the preeminent program for the design, construction, maintenance and operations of high-performance green buildings. LEED provides the framework to create a healthy, resource-efficient, cost-effective building. As construction began on The 428, the bricks of the former Woolworth building were carefully removed. 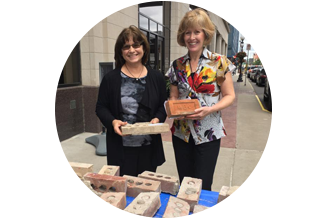 On a sunny September day, downtowners could pick up a brick and take home a piece of downtown St. Paul history.